The first lander's first picture, of footpad 3 (a 60° high-resolution image), demonstrated to everyone that the craft was safely down on the surface. Minutes later, camera 2 began taking a real-time picture, a 300° panoramic view of the scene in front of the lander. These shots had been planned to provide the maximum amount of immediate information so that images of value would already have been collected should something unforeseen terminate the operation of the lander. Thomas A. Mutch, lander imaging team leader, recalled, "The planning for these first two frames was exhaustive.'' Characteristically, everyone had some advice about the best photographs to take. More than a year before the landing, team members had been called to Washington to brief NASA Administrator James Fletcher on camera strategy. "In the event of a botched landing, the first two images might constitute our only pictorial record of Mars." The pictures would be sent to the orbiter in the first 15 minutes after landing and thence to Earth. Not for 19 hours, including the first night on Mars, would it be possible to communicate again with the lander. A primary photogeologic goal, perhaps because it is so easily quantifiable, is increase in linear resolution. Looking straight down, the slant range was abut 2 m yielding a linear resolution of approximately 2 or 3 mm. Looking toward the horizon, nominally 3 km distant, the linear resolution would have been reduced toward two or three orders of magnitude. 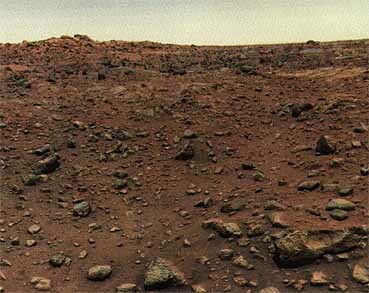 The first two photos of Mars received on 20 July 1976 were followed by a color photograph on the 21st. A lot of people would not forget that first color picture. Mutch tells the tale as well as anyone. During the first day following the early morning lauding of Viking 1 , his team was preoccupied with analysis and release of those first two images, "which, in quality and content, had greatly exceeded our expectations." So much were they concentrating on the black and white pictures, that they were "dismally," to use Mutch's word, "unprepared to reconstruct and analyze the first color picture." Mutch and his colleagues on the imaging team had been working long hours, along with everyone else, during the search for a landing site. Despite enthusiasm, people were tired. Many of the Viking scientists in the upcoming weeks would have to learn to present instant interpretations of their data for the press. For the first color photograph, haste led to processing the Martian sky the wrong color. 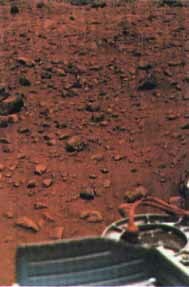 The first photograph (above) from the surface of Mars, taken minutes after the Viking 1 lander touched down on 20 July 1976. Center of the image is about 1.4 meter from the lander's camera no.2. Both rocks and finely granulated material are visible. Many foreground rocks are flat with angular facets. Several larger rocks have irregular surfaces with pits, and the large rock at top left shows intersecting linear cracks. A vertical dark band extending from that rock toward the camera may have been caused by a one-minute partial obscuring of the landscape by clouds or dust. The large rock in the center is about 10 centimeters across. At right is a portion of the spacecraft's footpad, eith a little fine-grained sand or dust deposited in its center at landing. 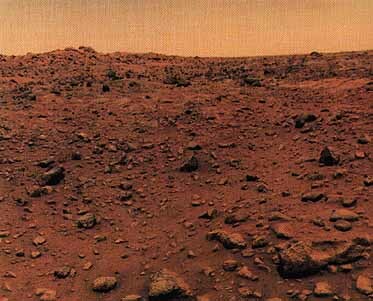 Below is the first panoramic view by Viking 1 on the surface. Horizon features are about 3 km away. A collection of fine-grained material at left is reminiscent of sand dunes. Projections on or near the horizon may be rims of distant craters. Some of the rocks appear to be undercut on one side and partially buried by drifting sand on the other. The housing of the sampler arm, not yet deployed, and the low-gain antenna are at left. In the right foreground are the color charts for camera calibration, a mirror for the magnetic properties experiment, and part of a grid on top of the lander body. At upper right is the high-gain antenna for direct communication between the lander and Earth. There were three sensors with blue, green, and red filters in the focal plane of the camera to record the radiance of the scene in blue, green, and red light. The multilayer, interference filters used in the lander cameras (filters that could withstand the rigors of sterilization) have an irregular spectral response. The blue channel, for instance, responds slightly but significantly to light in the infrared portion of the spectrum. The unwanted part of the signal must be subtracted, "so that the absolute radiances at three specific wavelengths in the blue, green and red are represented." Subsequently, color prints were produced by exposing conventional color film to  individually modulated beams of blue, green, and red laser light, scanning the film with the same geometry employed in the camera. Before the flight, the cameras had been calibrated and the sensitivity of each sensor-filter combination determined. "Qualitative tests indicated that simple normalization of the voltages for the three color channels was sufficient to produce reasonable color images. In making that judgment our attention was generally directed to saturated colors in the natural scene and test target." When the first color data were received, Mutch's specialists used the same normalization techniques to calibrate the image. "The result was surprising and disquieting. The entire scene, ground and atmosphere alike, was bathed in a reddish glow. Unwilling to commit ourselves publicly to this provocative display, we adjusted the parameters in the calibration program until the sky came out a neutral gray." The soil and rocks demonstrated good contrast, and the colors "seemed reasonable." This was the picture released eight hours later. "But in our chagrin," Mutch recalled, "the sky took on a bluish hue during reconstruction and photo-reproduction. The media representatives were delighted with the Earth-like colors of the scene." Two variations of the first color photo from the Viking 1 lander, taken on the Mars surface 21 July 1976. The blue-sky version above was released the same day. Below is the true red-sky version released 26 July. The red cast is probably due to scattering and reflection from sediment suspended int he lower atmosphere. To assist in balancing the colors, a photo was teaken of a test chart mounted on the rear of the spacecraft and the calibration then applied to the entire scene. The two photographs above were taken with the Viking lander camera during tests in the summer of 1974. At the top is a panoramic shot from a site overlooking the Martin Marietta Corporation factory in Denver. The lower photo was taken at the Great Sand Dunes National Monument in southwestern Colorado. The lander camera is a facsimile camera, different in design from the television and film cameras which have been used on many space missions. The field of view is not imaged simultaneously. Instead, adjacent vertical lines are successfully scanned. Reflected light from each of the "picture elements" in the line is recorded on a very small photodiode in the focal plane of the camera. Twelve diodes are available for use, each optimized for a different distance and a different part of the visible near-infrared spectrum. Photos permit comparison of the color of the Viking lander on Mars (at left) and Earth (above)- especially the orange cables. Tim Mutch used this guide to show that the red-sky rendition of the Mars landscape was the correct one. 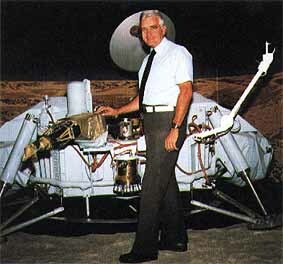 In the Earth photo, Jim Martin stands beside the science test lander in the Von Karman Auditorium at Jet Propulsion Laboratory. 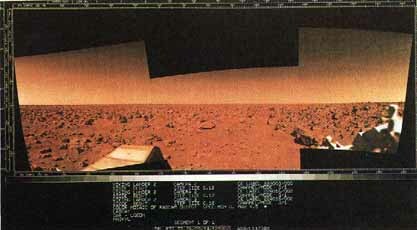 Photos taken by the Viking lander camera provide comparison of an Earth scene (above) and one on Mars (below). In a photo taken near the Martin Marietta Denver facility during tests in 1974, tan and reddish sedimentary rocks have been tilted and eroded to form prominent cliffs. Data from three diodes (blue, green, and red) were combined for the color picture. Colors have not been balanced; the blue contribution is unnaturally large. For mission photos, colors were carefully calibrated. The Martian horizon stretches across nearly 200° in the composite of three color photos taken 4 September 1976 (center), 5 September (right), and 8 September (left). A thin coating of limonite (hydrated iron oxide) colors the surface predominantly rusty red, although some dark volcanic rocks can be seen. The horizon is flat because the photo has been rectified to remove the effects of the 8° tilt of the spacecraft. Soffen pointed out that his personal involvement with the planet seas not unlike that of the other Viking scientists. It had been eight years since the beginning of Viking. With the landing, the investigators were hungry for every bit of knowledge, any new speculation that would lead to a better understanding of the nature of Mars. Before the first photographs were received from the lander, Mars was more a scientific problem than an actual planet. When scientists talked about atmospheric conditions, they were describing numerical quantities that had an engineering significance for the designers. But it was difficult to think in terms of real clouds, real winds, real temperatures in the way we discuss our own weather. As the science fiction writers had built imaginary worlds on which their stories could take place, the scientists too had created a Mars that seemed to fit their assumptions. But the planet created from earlier known scientific facts had very little similarity to the Mars that the orbiter and lander cameras portrayed. Mars as a real place was much more complex and interesting than any that had been conjured up in the minds of scientists. The new Mars of Viking has as many complicated processes at work as does Earth. If you were to tell a geologist that you were going to go out to two places on Earth with your little Brownie to take one or two rolls of film at each locality and then were to come back and from this interpret the history of the planet, he would think you were out of your mind, the most absurd thing he had ever heard of. In a sense it is. So one should not overestimate the exclusive model that you can generate from pictures. But one thing that could be said definitively was that the terrain of Mars was not bland. A complicated history is exposed particularly in the photographs taken at the Viking 1 site. "From a geological point of view, there is clearly a sequence of events represented....involving fundamentally different processes-for example, impact, wind, volcanic activity, possibly fluvial activity and possibly ground ice."